"I can give you golden rings, I can give you anything, baby, I love you." The diamond ring image had been used twice before in "Can’t Buy Me Love" and "I Feel Fine" and Lennon was having none of it. He dismissed the lyrics as "crap" and "too soft". 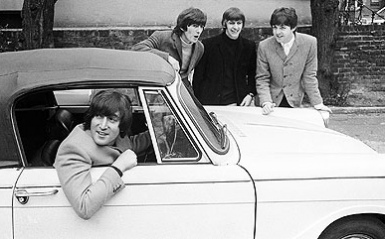 They decided to rewrite the lyrics and after some difficulty—McCartney said it was "one of the stickiest" writing sessions ever with Lennon – they settled on the "Drive My Car" theme and the rest of the lyrics flowed from that. The poppiest hook of the whole song "beep-beep–beep-beep- yeah!" was Lennon’s. 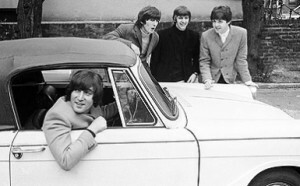 In some ways “Drive My Car” is a novelty number not unlike “Beep Beep (Little Nash Rambler)” by The Playmates or “Seven Little Girls Sitting In The Back Seat” – Paul Evans & The Curls but where it differers is The Beatles ability to lampoon the desire for fame without talent. You can see exactly what the girl in the first verse is like four lines in. Asked a girl what she wanted to be. Each of The Beatles embraced and used fame in their own ways but I think they could see the Fame Monster creeping around the corner. In the mid-sixties a new type of animal was appearing on the scene. The person who was famous for being famous. We all know how this played out. Today celebrity is the most valuable commodity in the open market. The Ukulele version of the song by Carmen Pelaez and Joel Someillan updates the theme and transfers it to modern day Miami – one of the main breeding grounds for the almost famous. Both are eager to impress and neither is listening to the other. Joel Someillan studied music and production at the Berklee College of Music in Boston graduating in 1994. 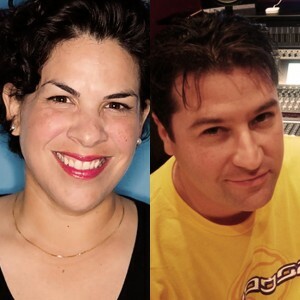 In 1998 he joined forces with world-renowned producer Emilio Estefan and earned numerous Gold and Platinum albums writing and producing for Latin artists such as Gloria Estefan, Shakira, Chayanne and many others. He’s won two Latin Grammys with album productions for Thalia and Obie Bermudez. He also earned a Grammy nomination for Album Of The Year for Chayanne’s Cautivo. Aside from songwriting, engineering, and album production, Joel is also very involved in children’s music. Together with musical partner George Noriega, he currently writes music for children’s TV shows such as Dora The Explorer and Go Diego Go! and has written theater shows for Nickelodeon and Dreamworks. They have numerous projects currently in development including the guidance and production of young, promising artists through their company, Jollipop Entertainment. Joel runs Someillan Productions and lives in the Doral area of Miami with his wife Elizabeth, daughter Victoria, and son AJ.